Media Circus: Candidates Brawl, Pundits Reverse Course Yet Again : It's All Politics Pundits fretted that the town hall format for Tuesday's presidential exchange would yield tepid results: undecided voters posing questions with little more than a passing touch from the moderator. The media's storyline quickly shifted, however, from the pressure facing the president after the previous debate to his more energetic performance. 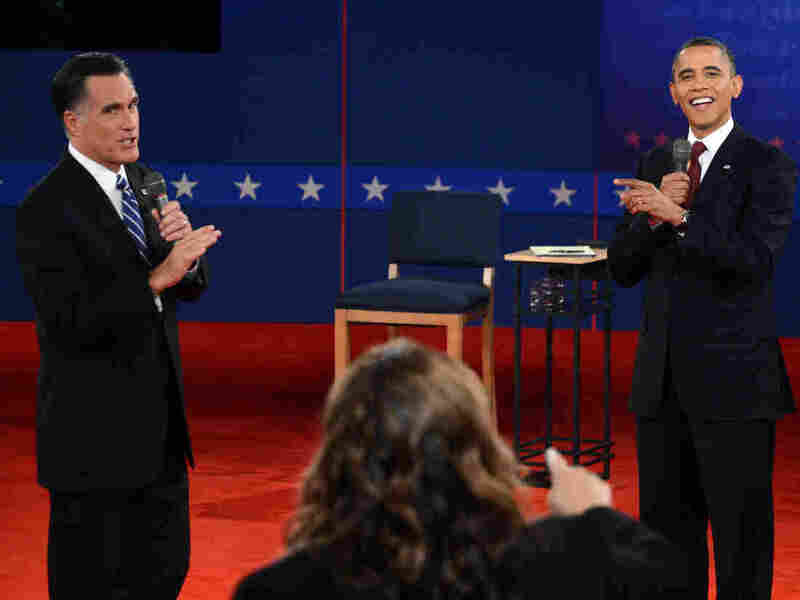 CNN's Candy Crowley moderates the second presidential debate between Mitt Romney and President Obama at Hofstra University in Hempstead, N.Y., on Tuesday. Pundits fretted that the town hall format for Tuesday's presidential exchange would yield tepid results: undecided voters posing questions over 90 minutes with little more than a passing touch from the moderator, CNN's Candy Crowley. Boy, was that a misplaced fear. "So much for the analysis this would not be confrontational," Fox News anchor Bret Baier said in the moments after the debate. Instead of offering pandering platitudes, former Massachusetts Gov. Mitt Romney and President Obama unveiled a mutual contempt society. The audience inside the auditorium at Hofstra University on Long Island audibly gasped, according to a media pool report, when Romney sought to shut down Obama: "You'll get your chance in a moment." It was an unusually tense moment, as a political challenger invaded the personal space of a serving president while seeking to silence him. That exchange speaks well, perhaps, of the vibrancy of American democracy. But it was a squirm-inducing moment nonetheless. I half expected to see David Plouffe and Kevin Madden to dash out from the wings and squirt Gatorade in their respective candidates' open mouths. For her part, Crowley posed her own follow-up questions in defiance of the two presidential campaigns, which initially tried to insist she only shepherd those from the audience. Indeed, late in the debate, she additionally served as "the first line of accountability" she promised in interviews last week. When Romney claimed Obama took 14 days to call the deadly attack on the U.S. consulate in Benghazi a terrorist act, Crowley directly contradicted him. Obama got a laugh by adding: "Can you say that a bit louder, Candy?" She did — but she also added it took time for the Obama administration to back off its initial explanations blaming an escalating protest against an anti-Islamic video. Obama came to battle Tuesday for his cause and his campaign, and he jabbed back at his Republican challenger. But the confident Romney of two weeks earlier yielded to his argumentative, prickly twin, tangling to a surprising degree with Crowley as much as his Democratic opponent. There were times when they clashed so much you wondered if she had ducked out of the hall to take a call. You could hear the media conventional wisdom being minted even as the evening came to a close. ABC News' Matthew Dowd, a former chief political strategist for President George W. Bush: "Clear victory for President Obama." Fox's Brit Hume: "[Obama] will probably be declared the winner of this on most cards." Daily Beast's Andrew Sullivan: "Obama dominated Romney tonight in every single way: in substance, matter, style and personal appeal. He came back like a lethal but restrained predator. He was able to defend his own record, think swiftly on his feet. ... He owned the presidency." Does it matter? Several news organizations rushed out instant polls and results from focus groups — the kind of quick-twitch feedback that may provide stray insights but really serve more to stoke the passions of voters who seek data to support their candidates. They showed more of a split, for what it's worth, which probably isn't much. Ahead of time, to their credit, news organizations sought to resist coalescing around any particular narrative, avoiding setting any conventional wisdom in stone before the debate, as each outlet cast about for its own iconoclastic and fresh take on — oh, whom am I kidding? Weekly Standard: Honey Boo Boo Endorses Obama. I must confess, I did not see that last one coming. But otherwise the news media built a solid wall of political peril faced by the suddenly very mortal and vulnerable Obama who was heretofore, according of many of these very same sages and news outlets, all but impervious to the most fearsome challenges that could possibly ever confront a president. Until three weeks ago when a diffident 90 minutes (on Obama's part) and a robust 90 minutes (on Romney's part) led President No. 44's standing in the polls to slide from "sure thing" to "sayonara." One of the most hilarious developments preceded the debate: Surrogates for the two campaign sought to spin reporters about the strength of the president's fortunes before the event itself. It speaks to the intellectual vapidity of the exercise when partisans parrot laudatory remarks ahead of the performance — a prebuttal! Imagine if a movie critic did that. But such practices are also an implicit rebuke to the media itself — as it speaks to the untrammeled hunger for the raw ingredients of cable programming and news articles for the endless news cycle. The new media narrative: Obama ascendant. A firewall created. And there was little better example of the rapidly shifting fortunes than the Daily Beast's Sullivan, who Tuesday said the president "owned the presidency." The headline on his essay posted just 48 hours earlier? "How Obama Gave the Campaign Back to Romney."